Zimbabwe’s Mugabe U.N. speech on gay human rights. 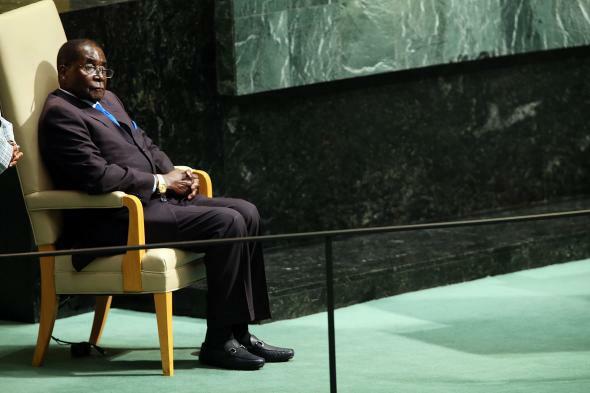 Zimbabwe’s President Robert Mugabe sits before speaking at the United Nations General Assembly on September 28, 2015. Zimbabwe’s (sort of) democratically elected strongman Robert Mugabe addressed the United Nations General Assembly on Monday. Mugabe, who at 91 years old could very well qualify as the loose cannon grandfather to be ignored at family functions if he weren’t the leader of a sovereign nation, took time out of his speech to address what he called the “new” human rights agenda being pushed by the West—more specifically, the attempt to stop the criminalization and persecution of homosexuals globally.